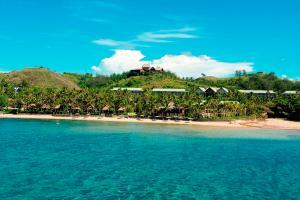 This luxury resort situated set on a white sand beach, among 40 acres of tall palms and lush tropical gardens in the heart of Fiji's Coral Coast. Facilities include one of the largest swimming pools in the South Pacific, extensive water activities, 24-hour fitness centre, 2 tennis courts, an international standard golf training facility, 4 restaurants, 5 bars, 2 Kids Clubs and the world class Bebe Spa Sanctuary. Located about one hour away from Nadi International Airport. Ivi Restaurant, Vale Ni Kana, Meke and Lovo (Fijian Dance and Feast), Sundowner Bar, Baravi Bar, Takai Bar, The Point Nightclub, Traditional Fijian Firewalking. Over 25 unique diving locations are situated just 20 minutes away via the Resort dive boat, including wreck and cave dives, drop offs and walls.